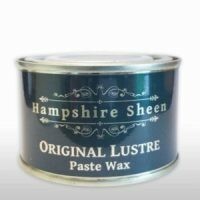 The original recipe for Hampshire Sheen brings a protective glow to your pieces. The product warms the looks of wood, whilst the carnauba and microcrystalline waxes add a lustre to wood whilst making it splash and fingerprint resistant. Easy to apply, Original will make a great addition to your collection of preferred finishes. For use on decorative wood only. Related links to "original lusture"
Customer evaluation for "original lusture"